"Certified organic" does not necessarily equate to "climate friendly." While there is some evidence that organic techniques produce as much as 40 percent fewer GHGs on average than conventional productions systems, other studies have found more or less a wash between the two. While scientists continue to debate the matter, it's important to realize that the organic standards were never intended to minimize GHGs—they're focused almost exclusively on eliminating synthetic chemicals from the food supply. There are many other factors that determine the carbon footprint of a meal, which have nothing to do with whether it was produced on an organic farm. For example, veggie burgers, whether organic or not, produce much fewer GHGs than bacon cheeseburgers. Biscuits made from wheat produced on a "no-till" grain farm are likely to have a lower carbon footprint than those from tilled wheat, even if the former is conventional and the latter is organic. And certainly, organic mangos from Brazil are much less climate friendly than apples from your neighbor's backyard, simply by virtue of eliminating transportation emissions. The climate implications of food are complex, poorly understood, not well quantified and not reflected in any of the popular eco-certifications out there. That's surprising given that the food system, by some estimates, is responsible for up to 29 percent of GHG emissions globally (more than transportation, energy production, or any other human endeavor). Below are some of the connections between food choices, production methods and climate change that, arguably, deserve much more attention. Overall, fruits rank in the middle of the various food groups in terms of greenhouse gas emissions—they're roughly the same as vegetables, much less than meat, and far above grains. If you want to add milk for a richer smoothie, consider seed and nut milks, which produce a fraction of the GHGs compared to dairy. Tree fruits (mangoes, apples, peaches, oranges) generally have lower emissions than those that grow from shrubby or herbaceous plants (bananas, blueberries, strawberries, raspberries). Tree fruits have great potential for multi-layered agroforestry systems, which can sequester nearly as much carbon as natural forests—unfortunately, such systems are bests suited to tropical agriculture, which, for those of us in North America, means all those food miles probably cancel out the GHG savings. Lettuce is actually three times more carbon-intensive than bacon, according to one study, though that's only when considered on a per calorie basis (of course we eat lettuce for nutrients, not calories). Part of the problem with lettuce and microgreens is they require huge amounts of freshwater to produce, which incurs a hefty carbon footprint from the energy required to pump it out of the ground. Thus, drought tolerant vegetables—such as dry-farmed tomatoes—are a safer salad ingredient. Root crops (radishes and beets) tend to be low in carbon emissions, while on the flip side, a handful of other vegetables are notably high, including bell peppers, avocado and asparagus. For the kimchi lovers out there, rest assured that cabbage is one of the least carbon-intensive crops. Most grains have three traits that help keep their emissions down: they are well-suited to no-till agriculture; they require relatively little irrigation; they grow so abundantly in North America that there is little reason to import them from afar. According to the Food Carbon Emissions Calculator, corn is one exception to this rule—cornbread has about twice the emissions as bread made from most other grains. Lamb is generally considered the most carbon-intensive meat, followed by beef, pork, turkey and chicken. Seafood fares a bit better than land animals on the whole, though salmon is higher in emissions than some livestock. Butter and cheese, according to at least one study, has a very large carbon footprint (on par with most meats), while milk is much lower. Tofu, legumes and most other vegetarian staples are very climate-friendly. Eatlowcarbon.org rates nearly 100 meals according to their GHG emissions—three bean soup, number one on the list, has 50 times fewer emissions than a hamburger, one of the most carbon-intensive meals. However, rice—one of the most widely consumed vegetarian staples in the world—has an outsize carbon footprint compared to most grains and legumes. By some estimates, rice cultivation produces 10 percent of all agricultural emissions worldwide. Fortunately, new rice cultivation techniques have emerged that are cutting into that total. Likewise, different grazing schemes have vastly different emissions outcomes, some of which actually sequester carbon if managed carefully. Livestock may be integrated into agroforestry plantings (an approach known as silvopasture), a highly efficient style of farming that produces multiple crops in an integrated system, while sequestering carbon. Collectively, the various approaches for modifying conventional farming practices to sequester, rather than emit GHGs, are known as carbon farming. 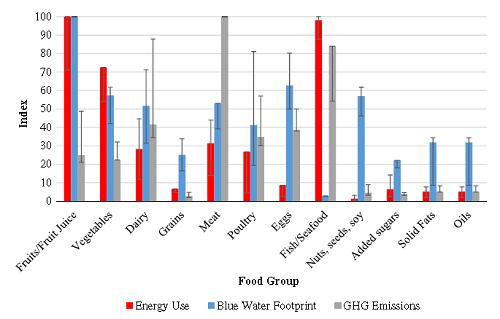 Desserts tend to include a combination of food groups—centered on fruit, nuts, grains and tropical specialties like chocolate, cinnamon and vanilla—so it's fairly easy to extrapolate their GHG impacts from the information above. Domestically produced nuts (pecans, walnuts, almonds) are a better choice than tropical ones (cashews, macadamias); same goes for fruit. When it comes to chocolate and tropical spices, there is no such thing as local, though most of these grow on trees and are sometimes produced in carbon-sequestering agroforestry plantations—any product labeled "shade-grown" would fall into this category. Plantations of sugarcane, a large tropical grass, have a very low carbon footprint (like grains, which are also grasses), though this is offset if the sugar is imported (most is, though a bit is grown in the southern U.S.); thus local honey, especially if the nectar source comes from native forests (like tupelo honey), is a better choice. Of the six desserts analyzed by eatlowcarbon.org, tropical fruit has the worst score, while seasonal domestic fruit has the best score, followed by chocolate chip cookies.